1. Preheat the oven to 200°C, gas mark 6. 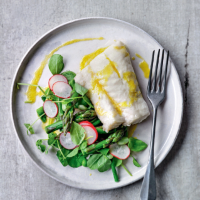 Place the cod in a small greased baking tray and bake for 15 minutes. 2. Meanwhile, cook the asparagus, green beans, peas and broad beans in boiling water for 3 minutes. Drain and cool under cold water. Mix with the pea shoots and radishes. 3. Whisk the oil, vinegar and mustard together. Season with a little salt and black pepper, then toss into the vegetable mixture. Top with the fish and serve.